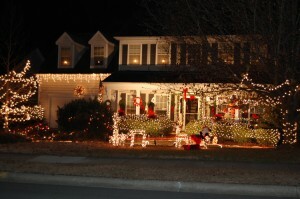 Holiday Decoration Winners and disappointing news. Thanks so much to everyone who participated in the Holiday Decoration Contest. Our neighborhood looks quite festive. It was so much fun (and FREEZING) to ride around on the hay ride and see all the lights. I hate to spoil the fun for everyone, but I have to add this little note. After the SL-Hay ride, the events team had to leave the fire pits in the parking lot to cool down. Once we came to retrieve them, the last two had been taken by unknown person(s). This is very disappointing. One of the firepits had been graciously loaned to us by a family outside of the neighborhood to help us save money on the event. If ANYONE has any information on this matter, please call 704-549-1449. Or if you know who took them, please encourage them to return them. We had such positive feedback on having the firepits and hope to continue to have them available but we cannot afford another loss like this. Some mysterious wind blew our firepits back a couple weeks ago. I don’t know how they got there, but they were on the pool house porch. So THANKS for returning them, whoever you are. Beautiful! I love to see all the decorations up during the holidays! Congratulations to the winners.